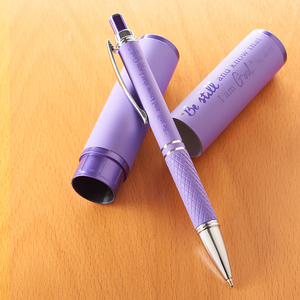 These stylish pens make the perfect gift or can be paired with a matching journal for added effect. Each pen is encased in a matching barrel. Scripture is screen-printed on both the pen and the barrel. The message on the green pen reads: "With God all things are possible" (Matt 19:26). The message on the pink pen reads: "The Lord bless you and keep you" (Num 6:24). The message on the purple pen reads "Be still and know that I am God" (Ps 46:10). Stylish Pen & Case Set - Single by Christian Art Gift was published by Christian Art Gifts, Inc. in October 2015 and is our 7359th best seller. The ISBN for Stylish Pen & Case Set - Single is 6006937130777. Be the first to review Stylish Pen & Case Set - Single! Got a question? No problem! Just click here to ask us about Stylish Pen & Case Set - Single.